"With the power delivered through a six-speed dual clutch transmission, the transition between electric and petrol is barely perceptible, while gearchanges when the car is running on petrol only are smooth." The appeal of plug-in hybrid vehicles took a slight knock in November, when the Government decided they would no longer be eligible for the plug-in car grant, preferring instead to offer the incentive only for zero emission cars. This means that owners can no longer apply for a £2,500 contribution towards the purchase price of the vehicle, which could also impact fleets through slightly higher lease rates than before. However, the technology still has plenty of appeal to fleets: they combine the benefits of typically 20 to 40 zero-emission miles and a petrol or diesel engine to enable the vehicle to cover long distances while removing the range anxiety sometimes associated with fully electric vehicles. 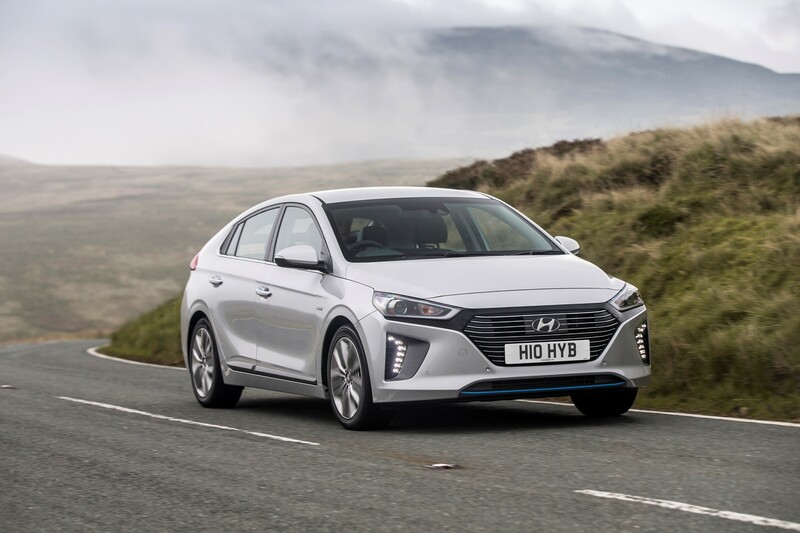 One of the leading models in the sector is Hyundai’s Ioniq 1.6h-GDi Plug-in Hybrid, and it’s easy to see why: it’s efficient, spacious and offers competitive running costs. Its 1.6-litre petrol engine and electric motor produce a combined power output of 141PS, while its 8.9kWh battery gives it a pure electric range of 39 miles. This helps give it an official combined fuel economy of 247mpg and CO2 emissions of just 26g/km, putting it in the 13% benefit-in-kind tax bracket for the 2018/19 tax year (meaning a 20% taxpayer faces a bill of £784). This rises to 16% in 2019/20 (£964) before falling 14% (£844) the following year. The battery takes up to one-and-a-half hours to charge from a 7kW charge point, and when fully charged the car defaults to electric mode. The petrol engine comes into life only under heavy acceleration until the battery charge expires. With the power delivered through a six-speed dual clutch transmission, the transition between electric and petrol is barely perceptible, while gearchanges when the car is running on petrol only are smooth. 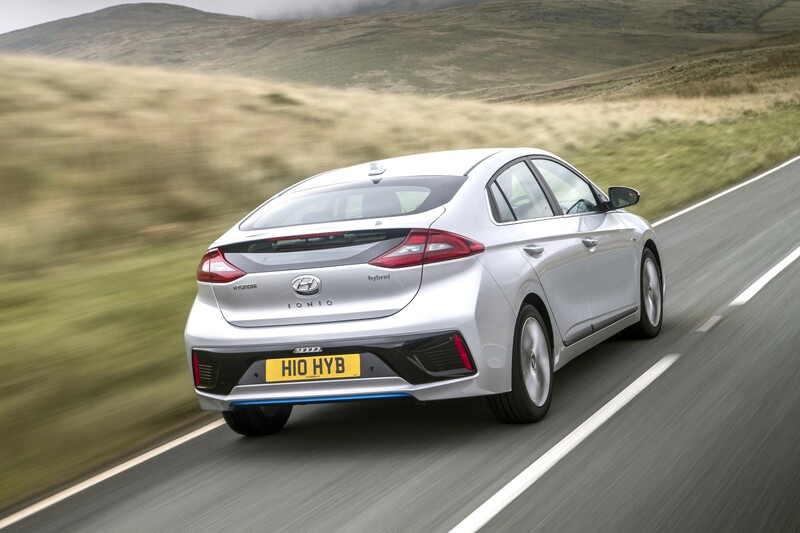 Acceleration is adequate rather than punchy, while the Ioniq’s comfortable ride marks it out clearly as an economic cruiser rather than a sports saloon. This is no bad thing in this instance, and its demeanour as a relaxed family car is enhanced further by its interior space. 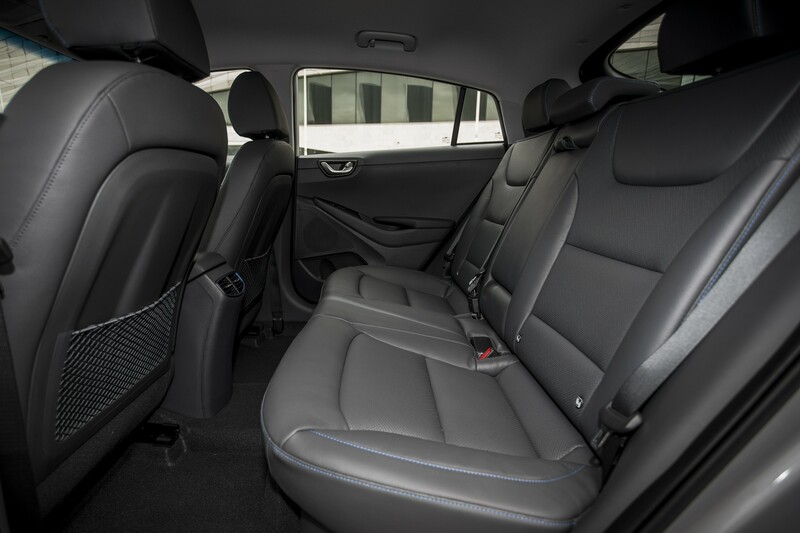 There is plenty of room for all passengers, with legroom in the back being particularly generous. However, its boot space falls short of class rivals. 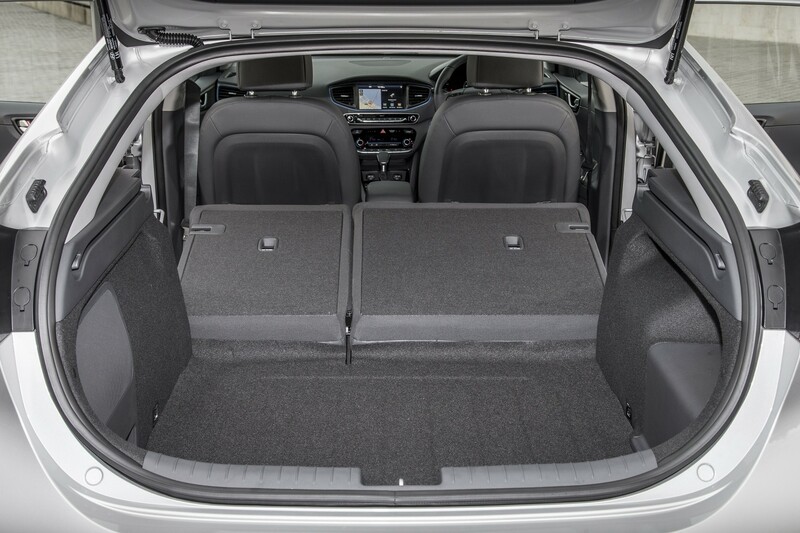 For example, at 341 litres, it is 54 litres smaller that of its i30 hatchback sibling. 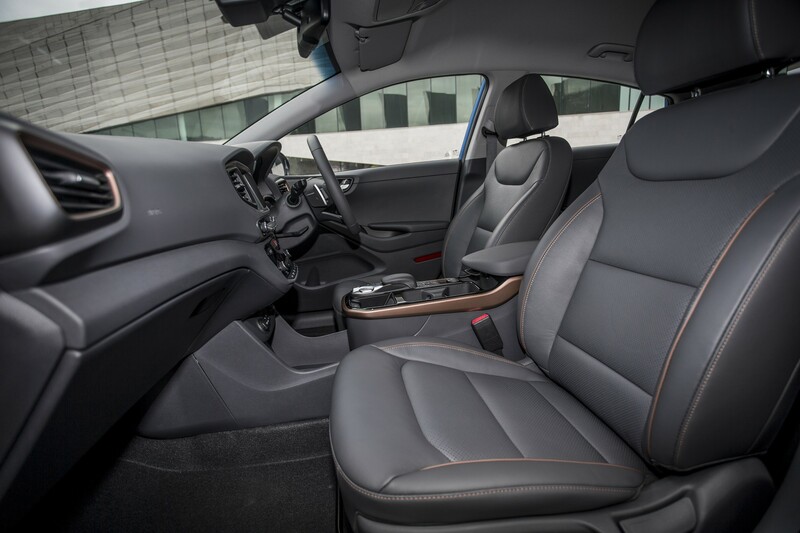 The car’s eco credentials are also reflected by the interior: the weight of the interior plastics has been reduced by approximately 20% through the use of a material made of recycled plastic combined with powdered wood and volcanic stone. The pay-off is that the materials do not feel as high quality as in many rivals, but it does feel very well put together. 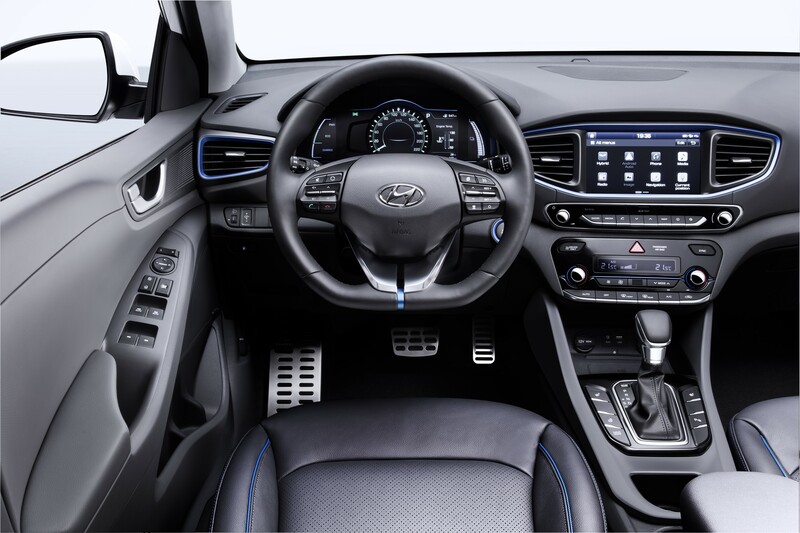 The interior is lifted by the Ioniq’s seven-inch TFT instrument panel and the infotainment system’s eight-inch touchscreen, while the list of standard equipment on our Premium SE test model also impressed. This includes heated and ventilated front seats, electrically-adjustable driver’s seat, heated rear seats, dual zone climate control, automatic headlights with dusk sensor, automatic windscreen wipers qith rain sensor, bi-xenon headlights, front and rear parking sensors, rear camera and guidance parking system. 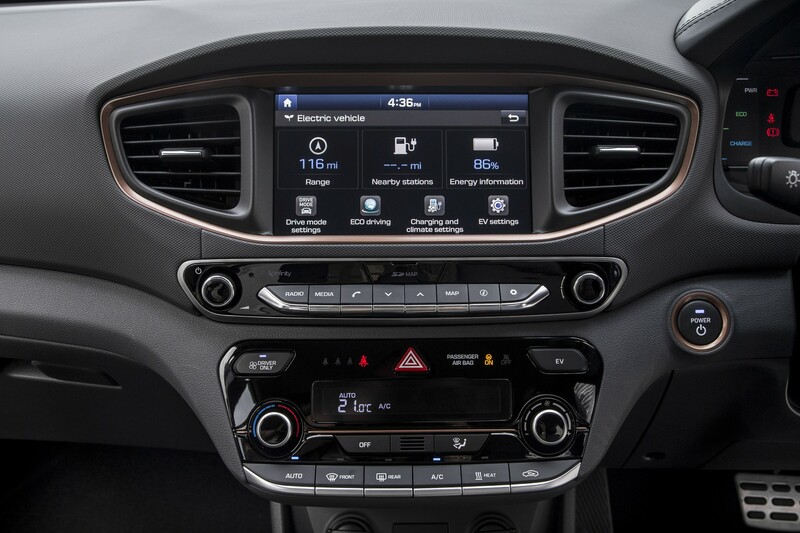 Android Auto and Apple CarPlay is also standard, as is satellite navigation – which has a list of charging points built-in - while Hyundai SmartSense active safety systems are made more widely accessible, with autonomous emergency braking, lane keep assist and smart cruise control all fitted. In short, company car drivers looking for driving thrills will probably be better looking elsewhere for a PHEV, but those looking for an efficient, comfortable, well-equipped model would do well to consider the Ioniq.